Image of the magnificent starburst galaxy, Messier 82 (M82). 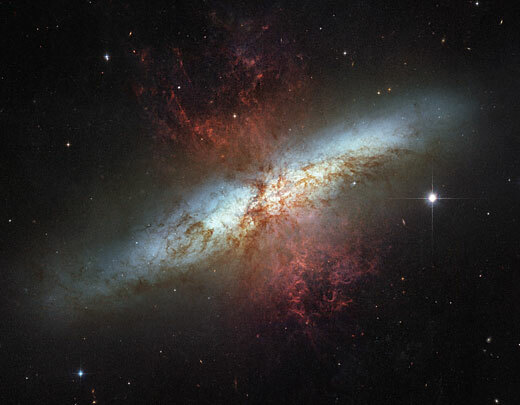 This mosaic image is the sharpest wide-angle view ever obtained of M82. The galaxy is remarkable for its bright blue disk, webs of shredded clouds, and fiery-looking plumes of glowing hydrogen blasting out of its central regions. The Hubble observation was made in March 2006. Astronomers assembled this 6-image composite mosaic by combining exposures taken with four colored filters that capture starlight from visible and infrared wavelengths as well as the light from the glowing hydrogen filaments. As the earth turns again into the night, a huge thunderstorm along the Earth's terminator (the demarcation betwewen day and night the edge of sunset/sunrise) - races spaceward - faster than the lands speeds downard and away from the limbs shaddow - "making the evening shaddows run" as it lights, as it wets and as it cools the twilight. 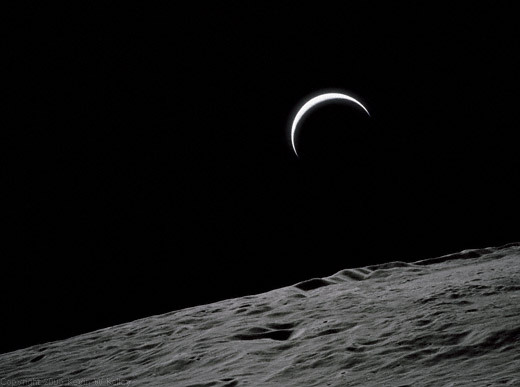 A crescent Earth rises over the moon, as seen by astronauts in lunar orbit. The exposure was set for the lunar surface and thus the Earth appears overexposed. 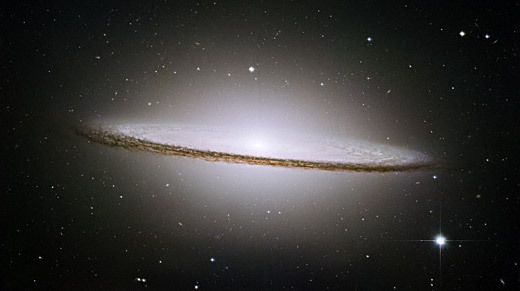 The Sombrero Galaxy reveals a swarm of glowing stars in a pancake-shaped disk, nearly one-fifth the diameter of the full moon. The galaxy, an edge-on spiral galaxy 28 million light years toward the constellation Virgo, is one of the better known objects in the evening sky. Light from this spiral galaxy emanates from billions of faint stars that form a vast bulge around its relatively tiny nucleus. More than 3,000 stars of various sizes appear in this image many of which have never before been seen in visible light. 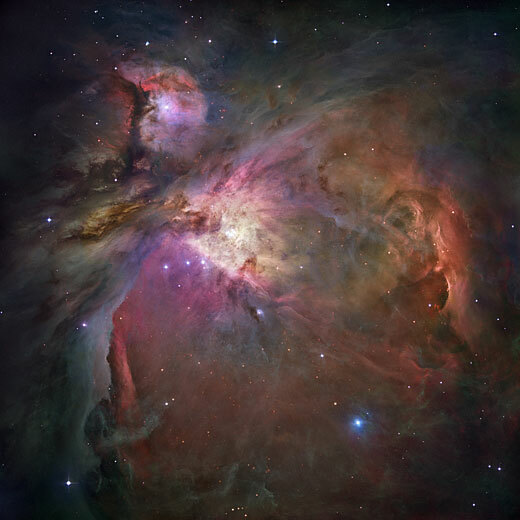 The Orion Nebula is 1,500 light-years away, the nearest star-forming region to Earth. Four bright stars called the Trapezium can be found in the central region of the nebula. Ultraviolet light unleashed by these stars is carving a cavity in the nebula and disrupting the growth of hundreds of smaller stars. Hoag's Object is a nearly perfect ring of hot, blue stars pinwheels formed about the yellow nucleus of an unusual galaxy. The entire galaxy is about 120,000 light-years wide, which is slightly larger than our Milky Way. 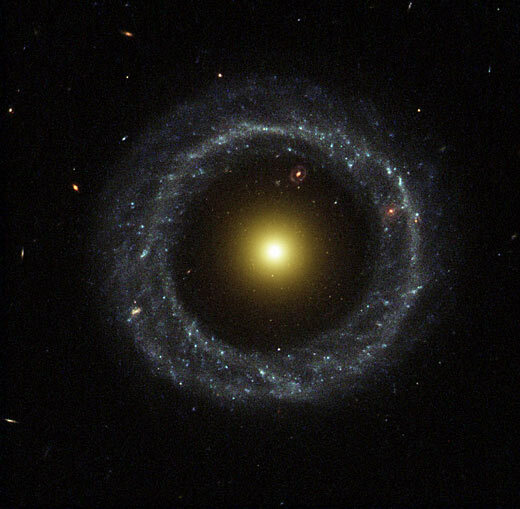 The blue ring, is dominated by clusters of young, massive stars, in sharp contrast to the yellow nucleus of mostly older stars. 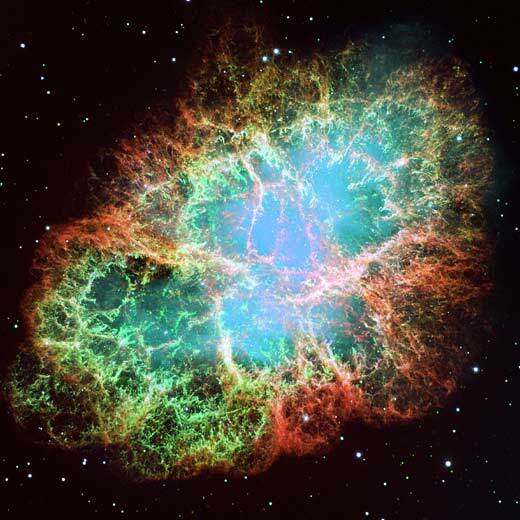 A rapidly spinning neutron star is the remnant of the star that formed the Crab Nebula and is the dynamo that causes its bluish interior glow. The orange filaments are the tattered remains of the star and consist mostly of hydrogen. This mosaic image of twenty-four individual Wide Field and Planetary Camera 2 exposures is one of the largest ever taken by NASA's Hubble Space Telescope. 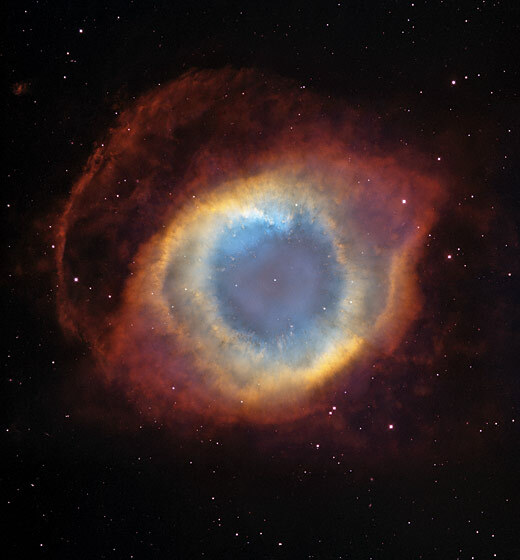 The Helix Nebula, one of the closest planetary nebulae, is located some 650 lights years away toward the constellation Aquarius. This nebula spans more than 1/4 degree of the sky, or more than 1/2 of the diameter of the full Moon. 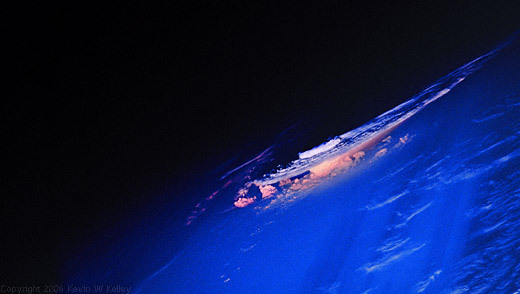 Blue light results from ionized oxygen, and red light results from ionized hydrogen and nitrogen.